At ComSat AV, we are the trusted CCTV solution for all business and commercial facilities. ComSat AV is a premier provider of closed circuit television (CCTV) systems. 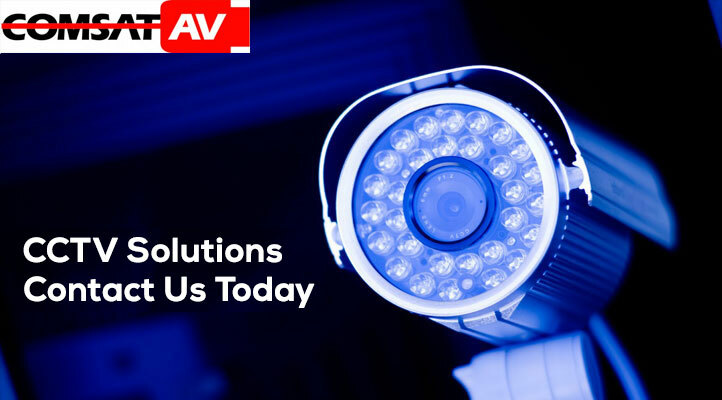 Our expert staff handles every aspect of CCTV implementation, from system design and consulting to install and technical support. Increased deterrent – CCTV systems are a strong discouragement to potential thieves. When a potential threat sees that your business is protected by a closed circuit television system they choose to go somewhere else. Reduced retail theft – businesses with poor security are deliberately targeted by shop lifters. Increased detection – the prosecution rates for businesses owners using CCTV is many times higher than that for those without CCTV. If you are unfortunate enough to be a victim of crime at least there will be a strong chance of detection and conviction. Remote monitoring – keep an eye on your business when you aren’t there. Our ComSat AV CCTV systems can be viewed and controlled remotely over the internet (via an iPhone, laptop etc). Receive warnings in advance – ComSat AV CCTV systems can alert you of any suspicious activity (via text or email), enabling you to view what’s happening and if necessary notify the police BEFORE a crime has been committed. Contact us to receive a personal consultation. Our experts will review the best options for your CCTV Installation needs. Your audio and video systems help set the tone, energy, and atmosphere of your establishment. ComSat AV is able to help your business move forward into the modern, digital era. Begin enhancing your patrons’ experience today, contact us for an initial consultation. Interested in digital signage? ComSat AV is your premier source for digital signage solutions. Send us a message or call: 866-582-3081.